Ariyalur is a town and distict headquarters of Ariyalur district in the South Indian state of Tamil Nadu. 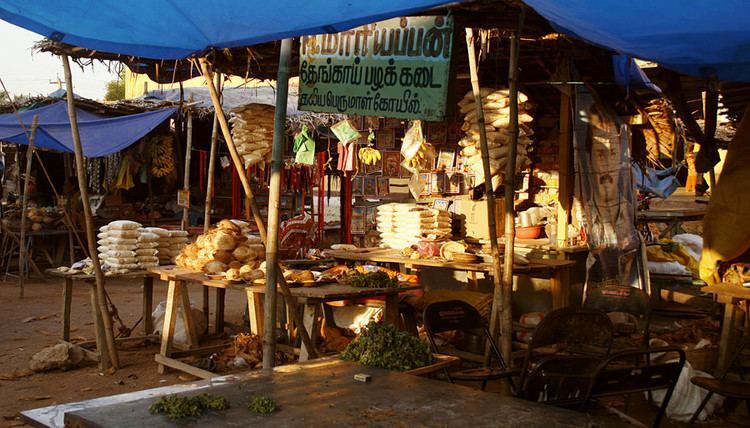 The town is located at a distance of 310 km (190 mi) from the state capital Chennai. Ariyalur is believed to have obtained its name from Hari Nindra Oor, meaning the place where Hindu god Vishnu had his presence. Ariyalur was a part of the erstwhile Trichinopoly District until Indias independence in 1947 and Tiruchirappalli district until 1995, Perambalur district until 2007 and subsequently a part of the newly formed Ariyalur district. The town is a part of the fertile Cauvery Delta and the major profession in the town is agriculture. Ariyalur is administered by a municipality established in 1994. As of 2011, the municipality covered an area of 7.62 km2 (2.94 sq mi) and had a population of 28,902. Ariyalur comes under the Ariyalur assembly constituency which elects a member to the Tamil Nadu Legislative Assembly once every five years and it is a part of the Chidambaram constituency which elects its Member of Parliament (MP) once in five years. Roadways are the major mode of transportation to the town and it also has rail connectivity. The nearest seaport is Karaikal port, located 95 km (59 mi) away, while the nearest airport is the Tiruchirappalli International Airport, located 76 km (47 mi) away from the town. In 1741 the Marathas invaded Tiruchirappalli and took Chanda Saheb as captive. Chanda Saheb succeeded in securing freedom in 1748 and soon got involved in famous war for the Nawabs place in the Carnatic against Anwardeen, the Nawab of Arcot and his son Mohammed Ali. Mohammed Ali annexed the two palayams of Ariyalur and Udayarpalayam located with troops were in the Ariyalur district on the grounds of default in payment of Tributes and failure to assist him in quelling the rebellion of Yusuf Khan. In November 1764, Mohammed Ali represented the issue to Madras Council and obtained military assistance on 3 January 1765. The forces led by Umdat-Ul-Umara and Donald Campbell entered Ariyalur and captured it. The young Poligar together with his followers there upon fled to Udayarpalayam. On 19 January the army marched upon Udayarpalayam. The Poligar’s troops were defeated and the playams were occupied. The two poligars fled their town and took refuge in Tharangampadi, then a Danish Settlement. The annexation of the palayam gave the Navab un-interrupted possession of all his territories extending Arcot to Tiruchirapalli. The history followed was a power struggle between Hyder Ali and later Tipu Sultan with the British. After the death of Tipu Sultan the English took the civil and military Administration of the Carnatic in 1801. Thus Tiruchirappalli came into the hands of the English and the District was formed in 1801. In 1995 Tiruchirappalli was trifurcated and the Perambalur and Karur districts were formed. Perambalur district was divided into Perambalur and Ariyalur district in the year 2001 and merged with Perambalur in the year 2002. Then now the district is bifurcated from Perambalur and now functioning from 23.11.2007. Ariyalur is a municipality and headquarters of Ariyalur District in the state of Tamil Nadu. It is rich in limestone resources. Big industrial houses like Birlas (UltraTech Cement), India cements, Dalmia cements, Madras cements have their cement units here. Tamil Nadu governments TANCEM factory is in Ariyalur and is the first factory to establish the cement production in ariyalur.